Saturn's performance this year is going to be an interesting one, if nothing else. As Earth and Saturn move through their orbits, Saturn's rings appear to "open" and "close". Basically the angle at which we are viewing the rings changes with Saturn's orientation relative to Earth and the Sun. 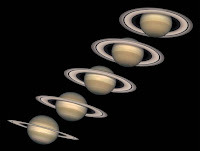 Saturn's rings will reach a minimum angle of 0.8° near the end of 2008. They will then reverse movement and start opening slightly before closing again completely next September. 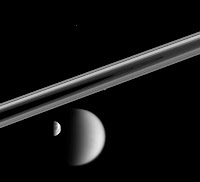 Many astronomers are disappointed at the near absence of Saturn's rings. The rings being edge-on also means that it will be very hard to see the Cassini division without excellent atmospheric seeing. Saturn's rings being closed isn't all bad, however. You could use this opportunity to observe the brightest of Saturn's 52 named moons. Since the rings aren't reflecting light back at us right now, the planet itself is a good bit dimmer. Since Saturn seems dimmer, it is easier to see some of its smaller satellites, such as Enceladus and Mimas. While observing Saturn this year, see how many of its moons you can find and identify. Another advantage of the rings being closed is that most of the light coming from Saturn will be from the planet's disc, so this is a great opportunity to observe cloud features on the face of the planet. Color filters can be of some use in observing Saturn's clouds. Saturn can show some interesting cloud banding and sometimes can even show some storms like Jupiter. So don't be discouraged from observing Saturn this year. Although its rings will be nearly closed, there are many other things to observe on Saturn! Through the positioning, I will master quite a few innovative awareness. I relish valuable info and facts you truly give up the reports. Presently please click here check cashing Thanks a large amount considerably to urge awful deliver the results.